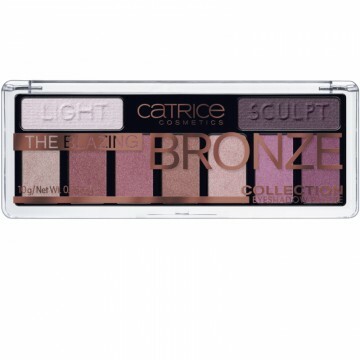 Catrice The Blazing Bronze Collection Eyeshadow Palette cu textura pulbere, extrem de pigmentate si foarte rezistente. Fard de pleoape Catrice este o paleta cu 9 nuante in total mate si sidef. Cu ascesta paleta de fard de pleoape Catrice The Blazing Bronze Collection Eyeshadow Palette iti poti realiza orice machiaj ( de zi sau de seara). Nuantele sunt usor de aplicat si de estompat. Pentru a prelungi rezistenta fardurilor este indicat sa aplicati si o baza pentru fardul de pleoape. Ingrediente: TALC, MICA, SYNTHETIC FLUORPHLOGOPITE, ALUMINUM STARCH OCTENYLSUCCINATE, NYLON-12, POLYPROPYLENE, OCTYLDODECYL STEAROYL STEARATE, PENTAERYTHRITYL TETRAISOSTEARATE, ZINC STEARATE, CAPRYLIC/CAPRIC TRIGLYCERIDE, POLYETHYLENE, DIISOSTEARYL MALATE, TOCOPHEROL, STEARYL DIMETHICONE, CAPRYLYL GLYCOL, OCTADECENE, PTFE, TIN OXIDE, HEXYLENE GLYCOL, DISODIUM EDTA, TRIOLEIN, CETYL PEG/PPG-10/1 DIMETHICONE, HEXYL LAURATE, POLYGLYCERYL-4 ISOSTEARATE, MALTODEXTRIN, LECITHIN, ASCORBYL PALMITATE, CITRIC ACID, DEHYDROACETIC ACID, PHENOXYETHANOL, MAY CONTAIN/[+/-]: CI 75470 (CARMINE), CI 77491 (IRON OXIDES), CI 77492 (IRON OXIDES), CI 77499 (IRON OXIDES), CI 77891 (TITANIUM DIOXIDE). AND/UND INGREDIENTS: MICA, TALC, SYNTHETIC FLUORPHLOGOPITE, ALUMINUM STARCH OCTENYLSUCCINATE, NYLON-12, POLYPROPYLENE, OCTYLDODECYL STEAROYL STEARATE, PENTAERYTHRITYL TETRAISOSTEARATE, ZINC STEARATE, CAPRYLIC/CAPRIC TRIGLYCERIDE, POLYETHYLENE, DIISOSTEARYL MALATE, TOCOPHEROL, STEARYL DIMETHICONE, CAPRYLYL GLYCOL, OCTADECENE, PTFE, HEXYLENE GLYCOL, DISODIUM EDTA, TRIOLEIN, CETYL PEG/PPG-10/1 DIMETHICONE, HEXYL LAURATE, POLYGLYCERYL-4 ISOSTEARATE, MALTODEXTRIN, LECITHIN, ASCORBYL PALMITATE, CITRIC ACID, DEHYDROACETIC ACID, PHENOXYETHANOL, MAY CONTAIN/[+/-]: CI 75470 (CARMINE), CI 77491 (IRON OXIDES), CI 77492 (IRON OXIDES), CI 77499 (IRON OXIDES), CI 77891 (TITANIUM DIOXIDE). AND/UND INGREDIENTS: MICA, TALC, SYNTHETIC FLUORPHLOGOPITE, ALUMINUM STARCH OCTENYLSUCCINATE, NYLON-12, POLYPROPYLENE, OCTYLDODECYL STEAROYL STEARATE, PENTAERYTHRITYL TETRAISOSTEARATE, ZINC STEARATE, CAPRYLIC/CAPRIC TRIGLYCERIDE, POLYETHYLENE, DIISOSTEARYL MALATE, TOCOPHEROL, STEARYL DIMETHICONE, CAPRYLYL GLYCOL, OCTADECENE, PTFE, HEXYLENE GLYCOL, DISODIUM EDTA, TRIOLEIN, CETYL PEG/PPG-10/1 DIMETHICONE, HEXYL LAURATE, POLYGLYCERYL-4 ISOSTEARATE, LECITHIN, ASCORBYL PALMITATE, CITRIC ACID, DEHYDROACETIC ACID, PHENOXYETHANOL, CI 77491 (IRON OXIDES), CI 77492 (IRON OXIDES), CI 77499 (IRON OXIDES), CI 77891 (TITANIUM DIOXIDE). AND/UND INGREDIENTS: TALC, MICA, SYNTHETIC FLUORPHLOGOPITE, ALUMINUM STARCH OCTENYLSUCCINATE, NYLON-12, POLYPROPYLENE, OCTYLDODECYL STEAROYL STEARATE, PENTAERYTHRITYL TETRAISOSTEARATE, SILICA, ZINC STEARATE, CAPRYLIC/CAPRIC TRIGLYCERIDE, POLYETHYLENE, DIISOSTEARYL MALATE, TOCOPHEROL, STEARYL DIMETHICONE, CAPRYLYL GLYCOL, OCTADECENE, PTFE, HEXYLENE GLYCOL, DISODIUM EDTA, TRIOLEIN, MALTODEXTRIN, CETYL PEG/PPG-10/1 DIMETHICONE, HEXYL LAURATE, POLYGLYCERYL-4 ISOSTEARATE, TIN OXIDE, LECITHIN, ASCORBYL PALMITATE, CITRIC ACID, DEHYDROACETIC ACID, PHENOXYETHANOL, MAY CONTAIN/[+/-]: CI 75470 (CARMINE), CI 77007 (ULTRAMARINES), CI 77491 (IRON OXIDES), CI 77499 (IRON OXIDES), CI 77891 (TITANIUM DIOXIDE). AND/UND INGREDIENTS: TALC, MICA, SYNTHETIC FLUORPHLOGOPITE, ALUMINUM STARCH OCTENYLSUCCINATE, NYLON-12, POLYPROPYLENE, OCTYLDODECYL STEAROYL STEARATE, PENTAERYTHRITYL TETRAISOSTEARATE, ZINC STEARATE, CAPRYLIC/CAPRIC TRIGLYCERIDE, POLYETHYLENE, DIISOSTEARYL MALATE, TOCOPHEROL, STEARYL DIMETHICONE, CAPRYLYL GLYCOL, OCTADECENE, PTFE, HEXYLENE GLYCOL, DISODIUM EDTA, TRIOLEIN, CETYL PEG/PPG-10/1 DIMETHICONE, HEXYL LAURATE, POLYGLYCERYL-4 ISOSTEARATE, LECITHIN, MALTODEXTRIN, ASCORBYL PALMITATE, CITRIC ACID, DEHYDROACETIC ACID, PHENOXYETHANOL, MAY CONTAIN/[+/-]: CI 75470 (CARMINE), CI 77007 (ULTRAMARINES), CI 77491 (IRON OXIDES), CI 77492 (IRON OXIDES), CI 77499 (IRON OXIDES), CI 77891 (TITANIUM DIOXIDE).